The rare French carton dolls of the late 1700s are the inspiration for Christine LeFever's "AnnaBeth" dolls. AnnaBeth has a papier mâché bust and cloth body and comes with her painted, handmade stand. She wears a period-style dress of pink and brown printed fabrics. 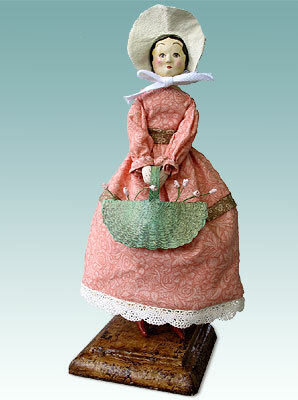 She has pantalets, petticoat and painted-on shoes, as well as a painted-fabric bonnet (removable), also in period style.